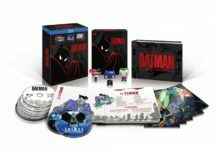 The first episode of BATMAN: THE ANIMATED SERIES! 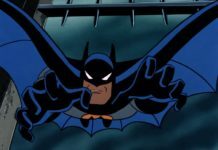 “On Leather Wings” is technically the first episode of Batman: The Animated Series with it being the first episode made in production as a pilot for the studio and audiences, though “The Cat and the Claw” was the first episode to air on television. As such, it’s a pretty good introduction to the world of Gotham City and what the series had to offer. The police hunt Batman after a bat-like creature breaks into a company and attacks a guard. 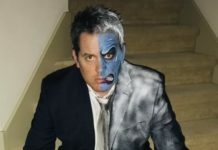 He goes on the case to clear his name and find the thief, only to discover something more monstrous is behind the break-ins. 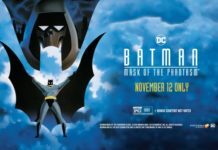 The episode has many hallmarks of a great Batman story; its mysterious, its well written and its focus is largely on Batman. In fact, “On Leather Wings” even emphasizes how much of a role Bruce Wayne would play in the series. Batman goes undercover as Bruce Wayne to get information on the strange bat-creature that has been breaking into pharmaceutical companies. You even get a taste of what his relationship with his trusty butler Alfred is like. 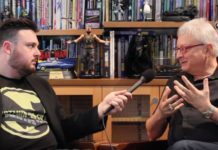 What is really impressive about the episode is its emphasis on mystery. 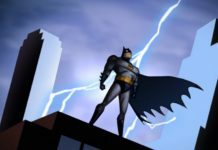 While Batman: The Animated Series is a superhero show first and foremost, its near-pilot episode lets the audience know that Batman’s status as the world’s greatest detective will be fully explored. It’s very cool to see him analyzing a crime scene, collecting samples and, as mentioned, going undercover. Kevin Conroy also shines in this episode as Batman and Bruce Wayne. 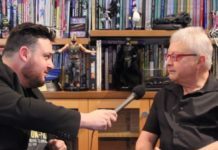 He really put in a lot of work creating two different voices for essentially the same character, using a higher, softer pitch for Bruce and a deeper, harsher tone for Batman. It adds to the show to see Conroy differentiate between the two and make you wonder which is the more dominant person, Batman or Bruce Wayne? (Though we all know the answer to that. In one moment its funny to see Batman using Bruce Wayne’s voice over the phone and in a fun bit of trivia, Conroy has the very first line ever spoken in BTAS — though not as Batman or Bruce Wayne (he voiced the helicopter operator). The animation is also very good, particularly Kirk Langstrom’s transformation into Man-Bat. I remember when I was a kid watching this episode and being terrified during this sequence. It’s really well done and for a cartoon made in the early 90s, the animation is still quite good throughout the episode. 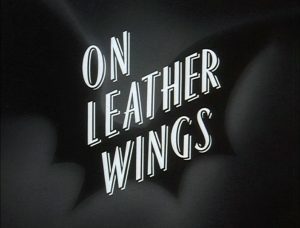 “On Leather Wings” even sets up other aspects of BTAS, such as Batman’s rivalry with Detective Harvey Bullock, Commissioner Gordon’s alliance with him and even a quick cameo of a certain D.A. who loves tossing a coin. Though it doesn’t do a whole lot of world building, it really lays the groundwork for what this series would feature and become with its emphasis on mystery and Batman.